Leading Manufacturer of pipe magnet from Ahmedabad. Pipe Magnets are T-trap magnetic separators that are specially manufactured for semi-liquid line flow and heavy duty large volume liquid systems. These magnet tubes hold on to the captured tramp metal particles in the rear of the tubes until these are cleaned. Positioning lugs of the magnet cage prevent the rotation when fluid flows through the trap. This is done when the positioning lugs mate with locating recessed in the body of the T-trap. 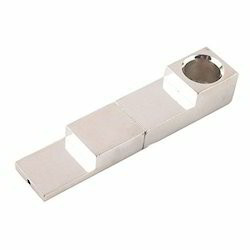 In addition, these pipe magnets are easy to clean as these have a top access bolt-on steel plate and seal. The ideal way to clean them is simply lift out the magnet cage, clean and wipe them off and then re-install. Looking for Pipe Magnet ?